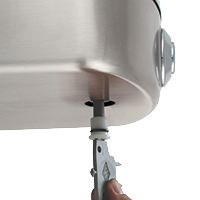 This is a standard (non-ADA) Rounded Box drinking fountain features a round vandal resistant pushbutton. This unit does not provided refrigerated water. Mounting plate (A0000000-MP1) must be ordered (available at no additional cost). The patented Push Button Auto Stop feature is part of Murdock A15-VR/A441-VR units. It seamlessly incorporates the heavy-duty Vandal Resistant button for additional security while allowing easy access to the push button for routine maintenance. How does Murdock do this? As an extra feature, an integral fine screen strainer, captures any small debris in the supply line, preventing it from entering the push button cartridge. When the strainer is removed, the water flow to the cartridge is stopped, allowing easy front access for its removal and replacement. Once the retaining ring is snugged down after cartridge replacement and the strainer is returned to its position, the stream height exiting the bubbler is easily adjusted right from the front of the button. Remember, this is ALL done without the time-consuming disassembly of the unit for routine maintenance!